The newly-discovered monster, known by the catalogue number 2XMM J083026+524133, is 7.7 thousand million light-years distant and is estimated to contain as much mass as a thousand large galaxies. Much of it is in the form of 100-million-degree hot gas. The bright blue blob of gas was found during a systematic analysis of catalogued objects as Lamer and his team were looking for patches of X-rays that could either be nearby galaxies of distant clusters of galaxies. Based on 3,500 observations performed with XMM-Newton’s European Photon Imaging Camera (EPIC) covering about 1% of the entire sky, the catalogue contains more than 190,000 individual X-ray sources. J083026+524133 stood out because it was so bright. 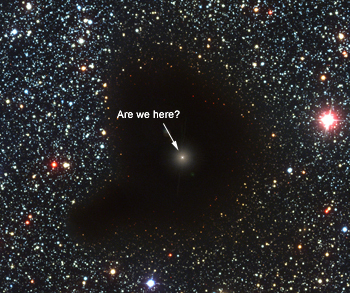 While checking visual images from the Sloan Digital Sky Survey, the team could not find any obvious nearby galaxy in that location. So they turned to the Large Binocular Telescope in Arizona and took a deep exposure, which found a cluster of galaxies in that location. The astronomers were surprised to find the cluster contains a thousand times the mass of our own Milky Way Galaxy. No one knows what dark energy is, but it is causing the expansion of the Universe to accelerate. This hampers the growth of massive galaxy clusters in more recent times, indicating that they must have formed earlier in the Universe. â€œThe existence of the cluster can only be explained with dark energy,â€ says Lamer. Yet he does not expect to find more of them in the XMM-Newton catalogue. â€œAccording to the current cosmological theories, we should only expect to find this one cluster in the 1% of sky that we have searched,â€ says Lamer. Dark energy is a hypothetical energy predicted to permeate through the Cosmos, causing the observed expansion of the Universe. This strange energy is believed to account for 73% of the total mass-energy (i.e. E=mc2) of the Universe. But where is the evidence for dark energy? One of the main tools when measuring the accelerated expansion of the Universe is to analyse the red-shift of a distant object with a known brightness. In a Universe filled with stars, what object generates a “standard” brightness? According to a new publication headed by Timothy Clifton, from the University of Oxford, UK, the controversial suggestion that the widely accepted Copernican Principle is wrong is investigated. Perhaps we do exist in a unique region of space where the average density is much lower than the rest of the Universe. The observations of distant supernovae suddenly wouldn’t require dark energy to explain the nature of the expanding Universe. No exotic substances, no modifications to gravity and no extra dimensions required. Clifton explains conditions that could explain supernova observations are that we live in an extremely rarefied region, right near the centre, and this void could be on a scale of the same order of magnitude as the observable Universe. If this were the case, the geometry of space-time would be different, influencing the passage of light in a different way than we’d expect. What’s more, he even goes as far as saying that any given observer has a high probability of finding themselves in such a location. However, in an inflationary Universe such as ours, the likelihood of the generation of such a void is low, but should be considered nonetheless. Finding ourselves in the middle of a unique region of space would out rightly violate the Copernican Principle and would have massive implications on all facets of cosmology. Quite literally, it would be a revolution. The Copernican Principle is an assumption that forms the bedrock of cosmology. As pointed out by Amanda Gefter at New Scientist, this assumption should be open to scrutiny. After all, good science should not be akin to religion where an assumption (or belief) becomes unquestionable. Although Clifton’s study is speculative for now, it does pose some interesting questions about our understanding of the Universe and whether we are willing to test our fundamental ideas. Discovering the universe is accelerating and not slowing down made it obvious to astronomers there’s a lot we don’t know about the universe; namely, a big chunk of it is missing from our visible observations. Astronomers determined roughly 4% of the universe is made up of ordinary matter and 27% of Dark Matter (inferred from gravitational affects on visible matter), leaving 68% unaccounted for. Dark energy, while still hypothetical, is what is believed to keep the pedal to the metal, so to speak, on the universe’s expansion. But an international group of astronomers believes that dark energy should be detectable, and they are constructing a huge camera, designed to look for it. The camera will consist of five massive lenses, with the largest at one meter in diameter, making it one of the biggest lenses in the world. A milestone was reached in the construction of this camera, as the pieces of glass for these unique lenses, seen in the image here, are ready to be shaped and polished into their final form. The Dark Energy Survey (DES) camera will map 300 million galaxies using the Blanco 4-meter telescope – a large telescope with new advanced optics at Chile’s Cerro Tololo Inter-American Observatory. This instrument will consist of an extremely red sensitive 500 Megapixel camera, with a 1 meter diameter, 2.2 degree field of view prime focus corrector, and a data acquisition system fast enough to take images in 17 seconds. The glass for the five lenses was manufactured in the US. In France the lenses will be polished to a smoothness level of one millionth of a centimeter. After, polishing, the lenses will be sent to the telescope in Chile. Observations are scheduled to begin in 2011, continuing until 2016. The team’s goals are to extract cosmological information on dark energy from counting galaxy clusters and the spatial distribution of clusters, and measuring the redshift of galaxies and supernovae. The Science and Technology Facilities Council (STFC) is providing support for the Dark Energy Survey (DES) collaboration, which involves over 100 scientists from the US, UK, Spain and Brazil. Being a very hands-on-type person, I have a hard time wrapping my brain around the concepts of dark energy and dark matter. These are invisible, hypothetical stuffs that cosmologists tell us make up a combined 96% of the universe. These ubiquitous substances are unlike anything weâ€™re familiar with. They donâ€™t emit or reflect enough electromagnetic radiation to be detected directly, but their presence is inferred by the gravitational effect they have on everything we can see. So, scientists are trying to determine if dark energy and dark matter are really there, and if so, what theyâ€™re made of. A couple of studies have come out recently dealing with dark energy and dark matter. One study released says that what we think might be dark energy may only be tiny whiskers of carbon materials, formed in the early days of the universe. And a new experiment tried to determine if dark matter is made of particles called axions. Andrew Steele and Marc Fries from the Carnegie Institution say that what we thought was dark energy may just be a haze of tiny whiskers of carbon, strewn across the universe and perhaps those whiskers — and not dark energy — would dim faraway objects such as supernovae. Scientists proposed the dark energy hypothesis a decade ago in part to explain the unexpected dimness of certain stellar explosions. The researchers report discovering an unusual new form of carbon in minerals within meteorites dating from the formation of the solar system. They believe the â€œgraphite whiskersâ€? were likely produced from hot, carbon-rich gases that formed near stars and were blown into interstellar space by solar winds or supernovae. A thin haze of the whiskers in space would affect how light of different wave-lengths pass through space. The researchers postulated that light of near-infrared wavelengths would be particularly affectedâ€”the same wavelengths whose dimming first led to the dark energy model. Things like these graphite whiskers have been proposed previously to possibly explain observations where dimming appeared, but the presence of any types of materials in space has never been confirmed previously, said Steele and Fries. With their discovery in the meteorite, the pair added, researchers can test the whiskersâ€™ properties against theories and observations. Dark matter: To make hypothetical matter, you might just need a little dash of hypothetical particles. How about axions? Axions are theoretical particles that have a small mass, about 500 million times lighter than an electron. Additionally, according to theory, an axion should have no spin. A group from the Fermi National Accelerator Laboratory (Fermilab) in Batavia, Illinois designed an experiment to try to find axions. They set up a magnetic field and shot a lazer into it. A â€œwallâ€? was placed in the middle of the magnetic field as well. It was thought that the magnetic field would possibly change some of the photons from the laser into axions. The wall would stop the photons, but the axions would emerge on the other side. They tried four different configurations of their system, unfortunately, the experiment found no evidence of new particles. But, they were able to exclude some constraints or regions where this type of particle could or could not exist. And the data from the Fermilab experiment is still being examined. Scientist William Wester is optimistic about the role he and his colleagues are playing. â€œWe did a serious measurement and excluded a region,â€? he says. â€œIf our small experiment helps heighten awareness and leads to more experimental efforts, even using other techniques as well, it will be a huge benefit that we have done this.â€? The group believes that maybe with a stronger magnetic field, it might be worth trying their experiement again. This brings to mind something that I heard cosmologist Michael Turner say: “If I succeed in confusing you about dark matter and dark energy, then I will have brought you up to where the experts are.â€? I’ve said it many times, but it bears repeating: regular matter only accounts for 4% of the Universe. The other 96% – dark matter and dark energy – is a total mystery. Wouldn’t it be convenient if we could find a single explanation for both? Astronomers from the University of St. Andrews are ready to decrease the mysteries down to one. Dr. HongSheng Zhao at the University of St. Andrews School of Physics and Astronomy has developed a model that shows how dark energy and dark matter are more closely linked than previously thought. Just a quick explainer. Dark energy was discovered in the late 1990s during a survey of distant supernova. Instead of finding evidence that the mutual gravity of all the objects in the Universe is slowing down its expansion, researchers discovered that its expansion is actually accellerating. Dark matter was first theorized back in 1933 by Swiss astronomer Fritz Zwicky. He noted that galaxies shouldn’t be able to hold themselves together with just the regular matter we can see. There must be some additional, invisible matter surrounding the regular matter that provides the additional gravitational force to hold everything together. And since their discoveries plenty of additional evidence for both dark energy and dark matter have been seen across the Universe. In Dr. Zhao’s model, dark energy and dark matter the same thing that he calls a “dark fluid”. On the scale of galaxies, this fluid behaves like matter, providing a gravitational force. And in the large scales, the fluid helps drive the expansion of the Universe. Dr. Zhao’s model is detailed enough to produce the same 3:1 ratio of dark energy to dark matter measured by cosmologists. Of course, any theory like this only gains ground when it starts making predictions that can be tested through observation. Dr. Zhao expects the work at the Large Hadron Collider to be fruitless. If he’s right, dark matter particles will have such low energy that the collider won’t be able to generate them. The paper was recently published in the Astrophysical Journal Letters in December 2007, and Physics Review D. 2007. Understanding dark energy is probably one of the largest mysteries in cosmology right now. Figure this out, and a Nobel Prize in physics is assured. But it won’t give up its secrets so easily. Since they can’t measure dark energy directly, astronomers can only measure its effects on the large-scale structures of the Universe, and then tease out some of its characteristics. In a recent survey using the European Southern Observatory’s Very Large Telescope, and international team of 51 astronomers from 24 institutions gathered the light from more than 13,000 galaxies. This survey contains galaxies within a 25 million cubic-light years volume. Using this survey, they were able to map out the large scale structures in the nearby Universe, including clusters of galaxies and filamentary superclusters. By measuring the velocity of the different clusters as they speed away from us, at different times in the past, the astronomers were able to measure the speed distortion contributed by dark energy. Their conclusions lend evidence to the so-called cosmological constant theory originally introduced by Albert Einstein – there’s some constant repulsive force that exists throughout space. But the uncertainties in their calculations doesn’t rule out other possibilities. One of the most popular of these is known as modified gravity. In this situation, gravity just acts differently at large scales than it does in the small scale. But the researchers feel that a measurement that might cover 10 times the volume of this survey could be able to tell the difference between a dark energy force of exotic origin or an actual modification of theory of gravity. “I did think I was crazy,” Prof. Georgi on the moment he stumbled on the “unparticle theory”. This is one of the major failings of the standard model – the unification of the four universal forces: weak force, strong force, electromagnetic force and gravitational force. The standard model unites the first three, but neglects gravity. Gravity simply does not fit. So Georgi took the bold step and calculated what could be generated by the LHC without the help of standard sub-atomic thinking and scale length restrictions. The unparticle would therefore be “scale invariant”, a property of fractals. Unparticles can interact over any scale lengths without restriction. When viewed, the unparticle will act as a fractal and will look similar over any scale (a characteristic known as self-similarity). Unparticles will also take on any mass, some or all the mass, depending on the scale you are viewing at. Now the implication of mass suddenly becomes interesting to the dark matter hunters out there. Unparticles could be a huge source of dark matter. As they have mass, unparticles would also possess an “ungravity”. Ungravity should have a strong, short-distance effect on matter in the observable world, and so, may be observed by sufficiently sensitive gravity probes. Whether unparticles exist or not, exploring the possibility that standard thinking may need to be slightly re-jigged for the extreme world of high energy particle collisions will surely lead to some healthy scientific debate. For now, we wait in anticipation for when the LHC goes online in May this year. Dark energy is probably the most influential force in the cosmos, overwhelming the pull of dark matter, and absolutely dominating the meager impact of regular matter. And scientists have absolutely no idea what it is. But a new supercomputer simulation by cosmologists at Durham University might give astronomers a few places to look; to know how to measure this mysterious force. When dark energy was discovered in 1998, it came as a complete surprise. By measuring the distance to supernovae, astronomers were hoping to calculate the rate at which the Universe’s expansion is slowing down. Instead of slowing down, though, they found that the expansion of the Universe is actually accelerating. Instead of coming together in a big crunch, it looks like dark energy will spread the Universe out faster and faster. Physicists now believe that dark energy makes up 70% of the Universe, with the remaining amount made of mostly dark matter, and a sprinkling of regular matter. Since that discovery, astronomers haven’t been able to find the source of this dark energy. So a new simulation, run on Durham University’s Cosmology Machine supercomputer could help astronomers in their search. The simulation looked at the tiny ripples in the distribution of matter in the Universe made by sound waves a few hundred thousand years after the Big Bang. These ripples have long since been destroyed by the 13.7 billion years of the lifetime of the Universe, but the simulations show they might have survived in some conditions. By changing the nature of dark energy, the researchers found that the ripples changed in length. In other words, if astronomers can find the ripples in the real Universe, this can help constrain the parameters for dark energy. An upcoming ESA mission called the SPectroscopic All-sky Cosmic Explorer (SPACE) should have the capabilities to detect these ripples, and so help put some constraints on the nature of dark energy. If all goes well, SPACE will launch in 2017. Dark energy is that mysterious force that seems to be accelerating the expansion of the Universe. But the question is: has it always been pushing the Universe apart with the same force, or was it weaker or stronger in the past, and will it get stronger in the future? Researchers from the Harvard-Smithsonian Center for Astrophysics have a plan to study distant clumps of hydrogen, to get to the bottom of this question, once and for all. Dark energy was first discovered nearly a decade ago, when astronomers noticed that distant supernovae were further away than their calculations were expecting. Some mysterious force appears to be accelerating the expansion of the Universe from every point in space. As space expands, more dark energy seems to appear. And although the amount of dark energy in any one point in space is tiny, across the vast reaches of space, it really adds up, accounting for more than 70% of the Universe. If dark energy is increasing, however, you could imagine it eventually becoming so strong that it starts to tear galaxy clusters apart, and then galaxies themselves, and even star systems. Maybe it might even become so strong that it tears apart atoms and even the fabric of space itself. Astronomers call this theory the “Big Rip”. Or maybe just the opposite is true, and dark energy will eventually become negligible to the expansion of the Universe. In order to see if the strength of dark energy is changing over time, astronomers are planning to carefully plot the position of clouds of neutral hydrogen, shortly after they formed from the Big Bang. Although it’s not possible now, future planned observatories should be able to trace this material all the way back to a time when the Universe was only 200 million years old. In the early Universe, small fluctuations in energy density and pressure caused oscillations. Although tiny in the beginning, these ripples have been magnified by the expansion of the Universe so that they stretch 500 million light-years across today. The clouds of neutral hydrogen should follow the same ripple pattern, so astronomers will know they’re looking at those first, primordial clouds, and not some closer ones. And so, astronomers will be able to look back in time, and study the distance to the clouds at each epoch in our Universe’s expansion. They should be able to trace how much dark energy was affecting space at each time, and get a sense if this energy has always remained constant, or if it’s changing. Their answers will shape our understanding of the Universe’s evolution, and its future. Dark energy. Does it exist, and what are its properties? Using galaxy-cluster images from NASA’s Chandra X-ray Observatory, astronomers have applied a powerful, new method for detecting and probing dark energy. The results offer intriguing clues about the nature of dark energy and the fate of the Universe. The Marshall Center manages the Chandra program. Astronomers have detected and probed dark energy by applying a powerful, new method that uses images of galaxy clusters made by NASA’s Chandra X-ray Observatory. The results trace the transition of the expansion of the Universe from a decelerating to an accelerating phase several billion years ago, and give intriguing clues about the nature of dark energy and the fate of the Universe. Allen and his colleagues used Chandra to study 26 clusters of galaxies at distances corresponding to light travel times of between one and eight billion years. These data span the time when the Universe slowed from its original expansion, before speeding up again because of the repulsive effect of dark energy. “We’re directly seeing that the expansion of the Universe is accelerating by measuring the distances to these galaxy clusters,” said Andy Fabian also of the IoA, a co-author on the study. The new Chandra results suggest that the dark energy density does not change quickly with time and may even be constant, consistent with the “cosmological constant” concept first introduced by Albert Einstein. If so, the Universe is expected to continue expanding forever, so that in many billions of years only a tiny fraction of the known galaxies will be observable. If the dark energy density is constant, more dramatic fates for the Universe would be avoided. These include the “Big Rip,” where dark energy increases until galaxies, stars, planets and eventually atoms are eventually torn apart. The “Big Crunch,” where the Universe eventually collapses on itself, would also be ruled out. Chandra’s probe of dark energy relies on the unique ability of X-ray observations to detect and study the hot gas in galaxy clusters. From these data, the ratio of the mass of the hot gas and the mass of the dark matter in a cluster can be determined. The observed values of the gas fraction depend on the assumed distance to the cluster, which in turn depends on the curvature of space and the amount of dark energy in the universe. Because galaxy clusters are so large, they are thought to represent a fair sample of the matter content in the universe. If so, then relative amounts of hot gas and dark matter should be the same for every cluster. Using this assumption, Allen and colleagues adjusted the distance scale to determine which one fit the data best. These distances show that the expansion of the Universe was first decelerating and then began to accelerate about six billion years ago. Chandra’s observations agree with supernova results including those from the Hubble Space Telescope (HST), which first showed dark energy’s effect on the acceleration of the Universe. Chandra’s results are completely independent of the supernova technique – both in wavelength and the objects observed. Such independent verification is a cornerstone of science. In this case it helps to dispel any remaining doubts that the supernova technique is flawed. “Our Chandra method has nothing to do with other techniques, so they’re definitely not comparing notes, so to speak,” said Robert Schmidt of University of Potsdam in Germany, another coauthor on the study. Better limits on the amount of dark energy and how it varies with time are obtained by combining the X-ray results with data from NASA’s Wilkinson Microwave Anisotropy Probe (WMAP), which used observations of the cosmic microwave background radiation to discover evidence for dark energy in the very early Universe. Using the combined data, Allen and his colleagues found that dark energy makes up about 75% of the Universe, dark matter about 21%, and visible matter about 4%. Allen and his colleagues stress that the uncertainties in the measurements are such that the data are consistent with dark energy having a constant value. The present Chandra data do, however, allow for the possibility that the dark energy density is increasing with time. More detailed studies with Chandra, HST, WMAP and with the future mission Constellation-X should provide much more precise constraints on dark energy. “Until we better understand cosmic acceleration and the nature of the dark energy we cannot hope to understand the destiny of the Universe,” said independent commentator Michael Turner, of the University of Chicago. The team conducting the research also included Harald Ebeling of the University of Hawaii and the late Leon van Speybroeck of the Harvard-Smithsonian Center for Astrophysics. These results will appear in an upcoming issue of the Monthly Notices of the Royal Astronomy Society.